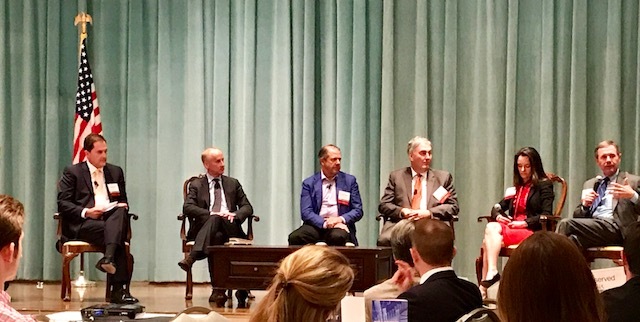 Investor sentiment about Houston was discussed by a ULI Emerging Trends panel recently. From left: Wally Reid of HFF, ULI Global CEO Patrick Phillips, Ric Campo of Camden, Mark Cover of Hines, Hilary Spann of CPPIB and Paul Murphy of Cadence Bank. Photo Credit: Ralph Bivins, Realty News Report. HOUSTON – (Realty News Report) – Fear of the Houston office market intensified about three years ago. The oil price crash whacked the energy companies, which dumped massive amount of office space onto the sublease market. Some office-building owners, like Cousins Properties, decided to hightail it out of town. Houston was an outcast in the capital markets world. Investors stayed away in droves. A lot of smoke has cleared. But Houston remains redlined in the minds of some. Hurricane Harvey tarnished Houston’s reputation even more. However, for those who investigate a little deeper, Houston now appears to be a good place to buy. “We like Houston for a number of reasons,” says Hilary Spann, managing director of CPPIB, an investment organization that just paid $1.2 billion to acquire a portfolio of 19 Houston office buildings, including Greenway Plaza. The main reason CPPIB decided to invest in Houston office space was this: “Houston is still in the nascent phase of its recovery,” Spann says. Spann told a ULI luncheon recently that when news leaked that CPPIB (Canada Pension Plan Investment Board) was making a big play in Houston, other investors began contacting CPPIB hoping to participate in the deal. That meant the word was getting out – the tide had turned. Some investors were beginning to believe that Houston had bottomed out and was coming back. Investor sentiment can change overnight. Houston, ranked the No. 1 real estate market in the nation in 2015, dropped all the way to No. 60 in the new Urban Land Institute’s ranking and evaluation of the nation’s best places for investment and development opportunity. Falling from No. 1 to No. 60, is a precipitous decline, enough to create a very queasy feeling into your gastric pit. 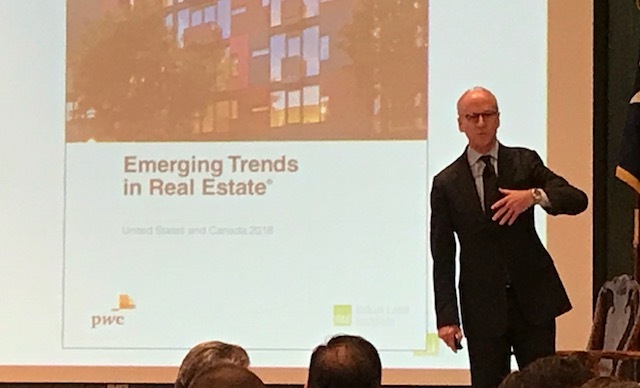 Patrick Phillips, Global CEO of the Urban Land Institute presents the ULI/PWC Emerging Trends in Real Estate report in Houston. Photo Credit: Ralph Bivins, Realty News Report. The ULI survey of real estate professionals included a lot of people who were interviewed before it was widely recognized that oil had stabilized in the $50 to $55 per barrel range, said Phillips, who visited Houston recently. Houston investment sales were horrible in 2016 – less than $400 million. In 2017, more than $4 billion worth of investment grade office properties have been purchased so far. Industrial properties have attracted investors as well. Industrial sales are up 127 percent, according to NAI Partners. Warehouse leasing is strong and a new breed of large distribution buildings are being delivered fully occupied. “Our industrial business has been going crazy in Houston,” says Mark Cover, CEO of Hines’ Southwest Region and Mexico/Central America. Cover told the ULI audience that office leasing is regaining its equilibrium and would-be tenants are more confident. Ric Campo, CEO of Camden Property Trust, a publicly traded multifamily firm, says investor sentiment can be mercurial. When news broke that Houston was going to be hit by Hurricane Harvey, Camden’s stock took a nosedive, Campo told the ULI audience. But a few days later, the story line changed. It became evident that Houston’s multifamily properties would actually benefit from the storm as thousands of flood victims were forced to flee from their single-family homes. Occupancy in the Houston apartment market skyrocketed. Then Camden’s stock price shot up in a hurry. Camden’s stock spiked to its all-time high of $96.39 per share on Sept. 8, about a week after Harvey left Texas. Wall Street had changed its mind about Houston.